If you’re looking to invigorate your classroom with games, video, personalization and other student favorites, this list is a great place to start. And best of all, most of the tools below won’t cost you or your school a dime. Yes, we know it's tough to make the transition to the Common Core State Standards — or whatever new learning standards your state has put in place for math, English language arts and science. But there are plenty of amazing resources out there designed to help you come up with new lessons, get professional development and manage your OERs. So if you’re looking to invigorate your classroom with games, video, personalization and other student favorites, this list is a great place to start. And best of all, most of the tools below won’t cost you or your school a dime. Looking for ways to get your students to practice their writing skills? This site facilitates in-class book-writing contests. The teacher selects a story start or inserts a first chapter, and the students write, read and vote on the submissions that will make up the following chapters. Once the books are done, they’re produced as real volumes and put up for sale in the site’s bookstore for $9.99 each. While the service is free for teachers who have at least a handful of students, there is a subtle push to students to join the premium $39.99 "writing club." Club members get one free book a year, avatar accessories and access to celebrity author contests. Last year, Renaissance Learning acquired K-12 digital reading program Subtext, and we’re happy to say that the transition has been a good one. The free app on iTunes and Edmodo still exists. Teachers can still create private groups to share content with students and keep discussions closed and add notes, polls, quizzes and Web links for students. The program works with ePubs, PDFs and Web articles. This iPad freebie from Curriculum Associates is designed to help develop vocabulary in alignment with Common Core’s goal of reading and understanding complex text. Relevant for assessments in grades 4 through 8, this game pushes players to use their vocabulary skills to keep Snargg, the “troublesome pet” of the BakeStars, out of trouble. Snargg has different ideas, however, and keeps escaping. Curriculum Associates also offers a free iPad app that mixes math practice with gaming. Intended for grades 4 through 8, Door 24 provides practice on the use of number facts, order of operation and algebraic thinking. Students work through six levels and multiple sets of problems to help Victor the robot get at the mystery behind Door 24. Door 24 doesn’t cover all CCSS math standards; but for free, who's complaining? The Missions are a collection of interactive math exercises, explanations of the solutions and links to the ubiquitous videos. Teachers gain access to maps to help identify math drills by standard, and they get reports that communicate student performance against the CCSS. Every single day of the school year, the NSTA posts another freebie resource for science teachers. Recent offerings include a link to a Curious George STEM collection, links to videos from the Department of Energy that explain the fundamentals of energy to middle and high school students and K-12 teacher links for staying in touch with the astronauts working on the International Space Station. Here are hands-on science lessons contributed by teachers, organizations and companies that can be plucked out of the collection by topic, grade, age or estimated time required. The site also includes a few teaching strategies and a number of communities formed by site members to pull together people with similar interests, such as Vietnamese teachers or teachers interested in biology. The site is available in English and Spanish. The only caveat: No new lessons have been added since mid-2013 — a light-year away when it comes to science topics and professional development guidance. This free and open online database, created by a group of education nonprofits and two public schools, offers Common Core-aligned materials that continue to grow as users contribute more learning resources. Content includes activities, videos, lessons, projects and book recommendations. Searching lets you choose grade level, type of resource, academic standard and other filters. Users can set up a “playlist” or “follow” certain teachers or schools, and schools that use the Activate API to hook in their student assessment data system can receive compilations of recommended resources based on student results. Wonder what the folk artists from Christopher Guest's mockumentary A Mighty Wind did after the movie was made? Maybe they went to work for Learning Upgrade, composing the songs that populate this set of Common Core-compliant courses that help students learn math and reading “through songs, video and games!” (And yes, they find a rhyme for “quadrilateral.”) Seriously, the free edition can be used by up to 20 students in a school and one teacher on a whiteboard; after that pricing is $30 per student per year or $7,500 for a schoolwide license. Web-based reports allow educators to track progress for students, classes and entire schools. This for-profit company selects 200 “highly qualified” practicing teachers from around the country each year to create its video lessons. The Dream Team meets at an all-expenses-paid, three-day professional development event that immerses them in the Common Core. Within the online service, a Navigator leads the teacher or learning coach to lessons covering specific standards. This K-8 curriculum, built on CCSS, is designed to create a personalized learning path for every student. The company promotes itself as helping teachers “find and fix missing skills”; it entices students with free prizes (snap bracelets, flexi-rulers and “mood” pencils), gaming features, badges and certificates. The free edition covers math, vocabulary, language and reading. For a $79 annual subscription, the Pro version adds a writing assignment module, test prep modules, printable worksheets and more. About 20 percent of the 500-plus projects and lessons included in this site are free; others require a premium account, which costs about $2 per month per teacher. You can hunt up lessons by grade, subject and Common Core standard. A free account gives you access to the PBS library of educational content, which you can hunt down by standard, grade level, subject or collection. Material comes in multiple forms: video, audio, document and interactive. Tired of waiting for publishers to create the books you want for your classroom? Create your own! That's the idea behind nonprofit CK-12, which helps teachers to assemble their own “FlexBooks” from 15,000 learning objects that are mapped to standards, Common Core and otherwise. The digital content comes in the form of text, video, audio, image, quizzes and activities. CK-12 provides content in 80 languages, from Afrikaans to Zulu. This “social learning platform” for PCs and mobile devices works like Pinterest for the classroom. Educators can post content to their personal eduClipboard website from their local drive or another website, add a title, description and tags and make it available to a student, class or the wider world of teachers. You can also make collaborative Clipboards as a class project. 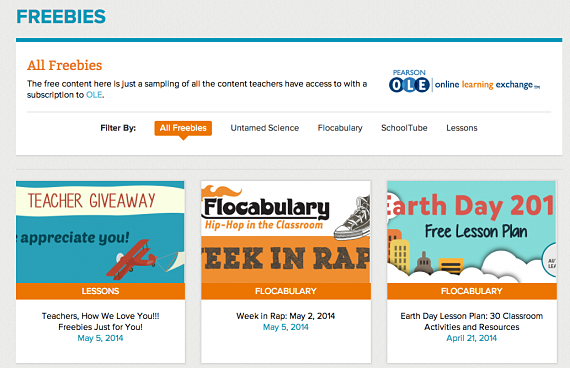 This collaborative community helps educators find free, open learning materials that can be rated, remixed and shared. Teachers can browse the library for relevant multimedia materials, add them to his or her collection, then assign it to the students. Each collection includes information about which CCSS it relates to, tells how many times it has been viewed and offers related concepts. The collection can be organized with narration, questions and the addition of personal materials. The company claims 16 million learning objects in its catalog and 50,000 teacher-created collections in math, ELA, science and social sciences. Overwhelmed by the hundreds of thousands of apps, lesson plans, videos and presentations available to you? Lesson Planet is a search engine and rating system that lets you find resources by any number of criteria, including CCSS and other state standards. This one isn’t a freebie (you can try it for 10 days), but it is low cost: about $60 for a year's access. This freebie allows an educator to manage and customize open educational resources into a custom textbook for use with tablets and laptops. But you don’t have to begin with a blank slate. You can use the starter books already available for math (grades 5 through 12), English (grades 6 through 10) and science (grades 6 through 12). If your school wants to make the shift to OER entirely, the company provides consulting to help with the transition. As of this writing, the company will be offering sessions in Washington, Connecticut, California, Colorado, Illinois and Florida. Whether you register for a session in math, ELA or leadership strategies, you'll get breakfast and lunch, two sessions of virtual follow-up, eight hours of professional development credit and a 60-day free trial to Discovery Education’s Streaming Plus service. Space is limited, so don't lollygag! The Online Learning Exchange is a paid service, but you can sign up to receive the company's newsletter, which will clue you into cool freebies from a large set of books, lessons and activities relevant to a given theme. For example, during the Olympics, the site provided a math lesson on calculating skating speeds. For Earth Day, visitors received a free lesson with videos, a lesson plan and activities on climate change debate appropriate for students in grades 6 through 12.